We are heading into the most wonderful time of the year: the holidays! This is particularly true for you because app installs are at an all-time high during this time of the year. Starting with Halloween and ending with New Years, there lies a huge opportunity for you to garner some serious attention by optimizing your app for the holidays. But what causes this install insanity to ensue? New phones and tablets as gifts + gift cards + travel time + time off of school + family bonding = tons of downloads. Why optimize your app for Christmas? It’s no secret that smartphones and tablets are among the most popular holiday gifts—both to give and receive. And, of course, device recipients will want to purchase fun new apps to use with their products. 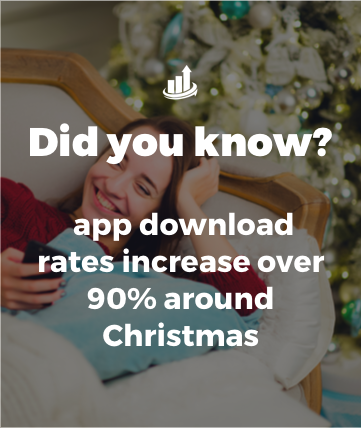 According to the mobile analytics company Flurry, app download rates shot up 91% over Christmas compared to rates from earlier in the month. While people worldwide will be purchasing apps for their devices this season, there’s no guarantee that your mobile product will make their lists. In light of the holiday app-buying surge, it’s crucial that app developers work hard to ensure their creations find appropriate audiences. As an app developer, you naturally want to take advantage of the Christmas holiday to maximize sales. Just as brick-and-mortar shops utilize holiday music and décor to boost profits, apps can give themselves a virtual makeover to reflect the themes of the season. Along with posting Christmas-y screenshots and icons, companies can create holiday savings bundles, so the customer receives multiple apps at a discounted rate. And of course, everyone appreciates a free app purchase during the holidays. The goal is to improve engagement while increasing click-through rates and sales. Additionally, app sellers might want to make use of social media during the holidays. During this time of year, many of us use our mobile devices to browse social media sites and connect with friends and loved ones in different parts of the country. For best results, offer informative tips about using your app or share fun, appealing photos of your product in action. If you can successfully promote your app on Facebook or Twitter, you might just find yourself reaping the benefits in added sales. And don’t forget to “like” and “retweet” fans’ comments to thank them for their words. Taking time to create stunning graphics shows users you care about keeping them entertained with the best quality game or app. Your hard work and attention to detail will pay off by increasing user retention and increasing installs during the holiday season. It’s also the record high time of the year for installs. There’s more to the holidays than just a Western Worldview of Christmas. Don’t forget to optimize according to your localizations! Hanukkah is a Jewish holiday that’s celebrated for 8 days and nights. The Jewish calendar is based on the lunar cycle, so Hanukkah can fall anywhere from November 28th to December 26th. Kwanzaa is a celebration African culture and is celebrated by over 5 million people in the US alone each year. Las Posadas is celebrated by many Hispanic families from December 16th – 24th. Diwali, also known as the Festival of Lights, is a 5-day long Hindu holiday that takes place in October or November each year. The Chinese New Year is a 15-day long celebration that culminates in a huge lantern festival, welcoming the end of winter and the beginning of spring. Optimize your title to capitalize on Holiday game searches. This is particularly useful for games that have updated their in-app character skins or level skins. It can also be useful for m-commerce apps that are offering special Black Friday, Cyber Monday or Christmas deals and specials. Who doesn’t love seeing an adorable costume added to their favorite app icon?! Garner holiday attention for Thanksgiving, Black Friday, Christmas, etc. with a newly updated app icon and screenshots. 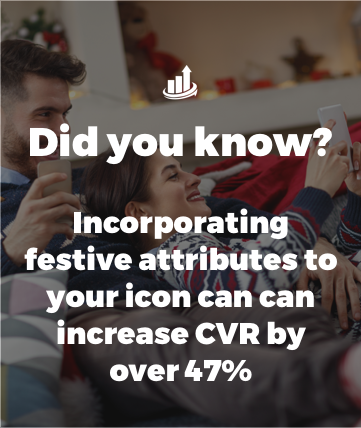 Incorporating festive attributes to your icon can can increase CVR by over 47%. If you plan on adding new graphics inside your app (i.e. adding snow or hats to your game characters), you could even create a holiday-specific preview video. Users appreciate when apps put the extra effort in to make things fun for a new season. Take advantage of this fun trend in 2018! What’s second best to fun new graphics? A cute holiday blurb added into your description! 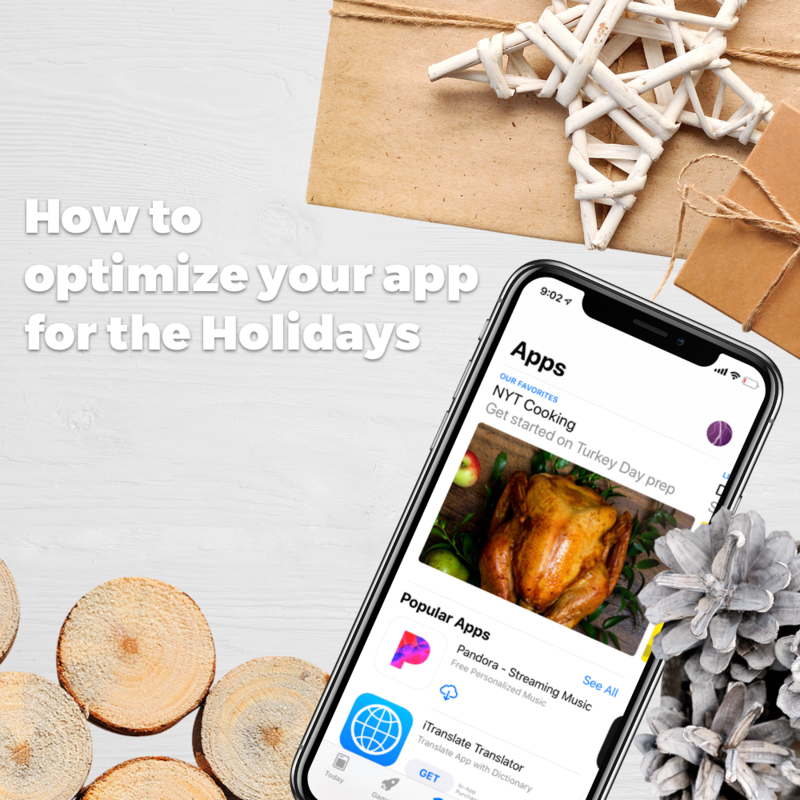 Consider telling a little story that goes along with your app and the specific holiday for which you’re making the optimization. Try a spooky Halloween story or a Night before Christmas tale to tie in your app’s features or characters. Is your app or game using any Christmas-y characters? 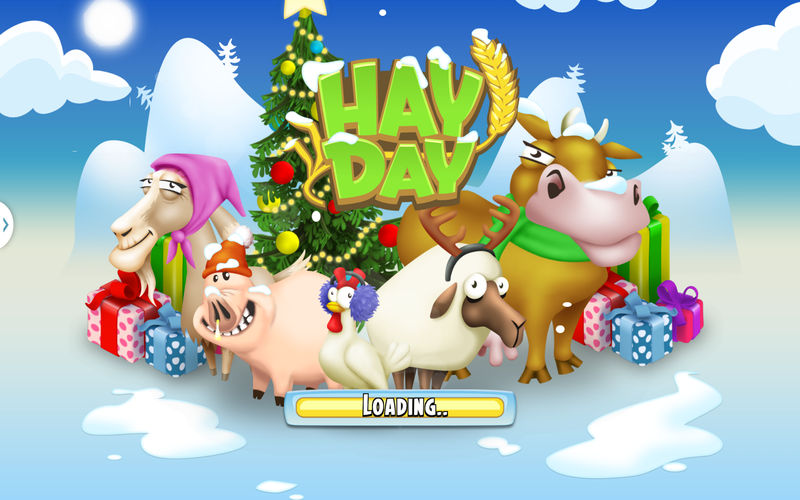 Are there new features, games, or In-App Purchases that are specific to the holiday season? Include relevant Holiday keywords in a natural way (always write for the reader and not just the algorithm) and explain how your app is useful or has new features for Christmas (i.e. new in-app themes, specials on in-app purchases). It’s a great idea to capitalize on holiday-related keywords for app store optimization, especially Shopping apps. Tie your title to Black Friday Deals or Christmas shopping with words like “Cyber Deals”, “Plan”, “Shop”, “Christmas Gifts”, or “Save”. Adding special holiday features or special in-app purchases is another way to entice users to download or re-engage with your app. Consider adding “gifts” for your users like extra coins/in-app currency or holiday bundles at a reduced cost (and for a limited time)! Update in-app features with a Christmas or Holiday themed skin or a free present for users (i.e. an in-app currency gift or ability to unlock a special Christmas level in a game). How about a boost in retention? Try adding a Christmas count-down calendar with a new gift if users come back each day leading up to Christmas! The more usage and retention the better! re-engage old users with new graphics and especially with new in-game holiday features! ASO Reminder: Don’t forget that the review process in iTunes Connect shuts down for a week around the Christmas holiday to allow employees to take a much-needed break. Make sure to get your testing and review process done before Christmas week! At The ASO Project, we offer expert App Store Optimization solutions for some of the top-ranking apps worldwide. Using our proprietary technology, we help developers analyze keywords and select the best titles, screenshots, descriptions and even preview videos. Additionally, we utilize focus groups to generate real, quality reviews about your products. As your app acquires more genuine reviews, it will naturally rise through the search results. Ask The ASO Project about our ASO services and link-building programs to increase app rankings and downloads. We look forward to helping you find success for your mobile product: contact us today. Erin Schnittker is a graphic design & digital marketing expert with 8 years of experience in content strategy, creation and design. She has worked on a significant number of household brand names, successfully optimizing their inbound marketing schemes to best attract, covert, close and delight consumers on an international basis. Erin’s unique understanding of user behavior and App Store Optimization, has proven to be a winning combination when applied to the creative optimization of our clients’ apps.